If you're looking for something to eat, somewhere to explore and someplace to experience unique Kyoto specialties, then you must come to Nishiki Market! The Nishiki Market now spans five, covered street blocks with hundreds of shops and restaurants on either side. Because the market is a covered pedestrian walking area, this is a great place to come if it happens to be raining while you're visiting. They call this market "Kyoto's Kitchen" since anything you need to prepare your meals is all right here under one roof. While hundreds of shops selling unknown items might seem overwhelming, this post gives you a great guide to finding the best this market has to offer! The market was first opened in 1615! Back then, it was a traditional wholesale fish market. Today, is are still lots of fish being sold, but unlike Tsukiji Market where it is almost solely fish, this market sells everything from fresh fruit, pastries, cooking utensils, pickles, dried seafood, knives, regional specialties, desserts and more! Tsukemono (Japanese pickles) are to be found all over the place. Barrels of colourful veggies sit inside salty brine and are a popular side dish to be served with side rice or as an everyday snack. These pickles are also a very important part of the kaiseki portion of a Japanese tea ceremony in Kyoto. Samples are available as you walk through the market so if there's anything you're curious about don't be shy to ask. A few words in Japanese will win over the vendor, and he will be glad to help you experience his dishes. Another favourite treat inside Nishiki Market is Warabimochi. Mochikiya sells jelly-like cubes of green tea flavoured mochi. Mochi is pounded rice which has been slightly sweetened and mixed with matcha (green tea). The mochi at Mochikiya is considered some of the best in the world. It is soft, fragrant, and a delicate snack. I think for me, it needs to be slightly sweeter, it's a still a little too bitter for my North American palette, but some people go nuts for this stuff. For me, one of the best snacks here is there soy doughnuts! Kyoto Tofu Fujino’s Konnamonja sells light and healthy doughnut made from soy and covered with a variety of toppings. I chose the brown sugar and soybean flour flavour which was amazing. Sweet and airy! You could eat at a high top table, and people watch while downing a few dozen of these delicious treats. Another wonderful things to bring home with you with freshly ground chili power, made from perilla. Perilla is a combination of basil and Szechwan pepper and gives any dish a unique zing! 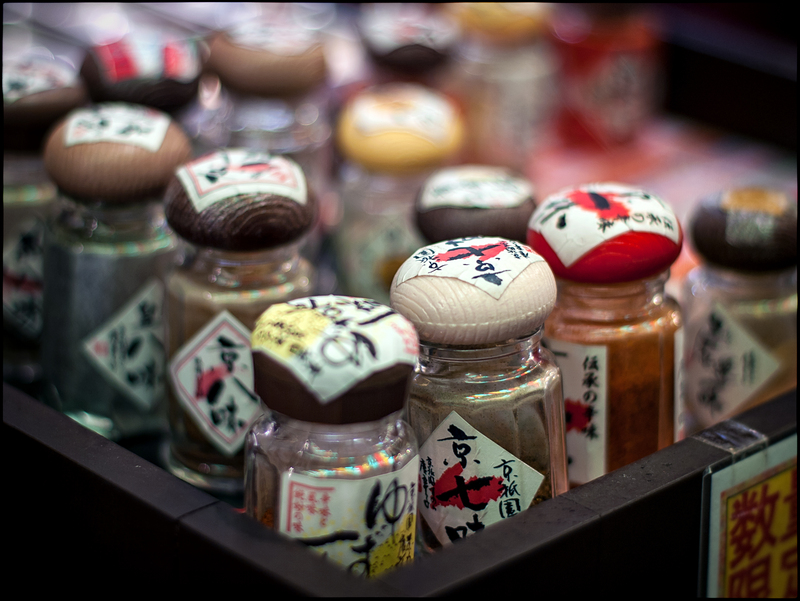 There are a myriad of other spices for sale in the market too, and these are a great souvenir to bring home to add a bit of Japanese flavour to your meals. Undoubtedly, one of the best kinds of fish in Nishiki market is their barbequed fresh water ell, or unagi. The eel is cooked over charcoals and then covered in a sweet, kabayaki sauce. While the fish can be very expensive you can buy bit size squewers on the street for only a few dollars. Great to sample if you've tried it before. One of the strangest things you might see across the market looks like something from 20,000 Leagues Under the Sea. These tiny octopuses are called tako tomago. They are baby octopus', stuffed with a tiny boiled quail egg and covered in a sweet, red sauce. They look strange but taste delicious - if you're brave enough to give them a try. Bright green, bark-like barnacles sit in water and might look like modern art but this is actually fresh wasabi! Some of the best sushi restaurants in Kyoto get their fresh wasabi from here. While this might not be something you want to buy, they are worth looking at and same sellers offer fresh wasabi to try - just be warned , it's very spicy. A traditional Japanese candy called Konpeito is a popular souvenir and snack for many people who come to the market. The brightly coloured candy is covered in little bubbles and although it's synonymous with Japan, it originally came from Portugal and introduced to the Japanese in 1546. Although not the tastiest, they make very pretty souvenirs. Another one of my favourite treats are mochi strawberries. Inside there is a little bit of red bean filling which adds to the overall taste. They are sweet and soft and best of all, portable so that you can grab a few for your picnic and head on out! A great dish to try in the Fall are the roasted chestnuts. Known as kuri they can be roasted, boiled, steamed, candied or dried but as always delicious! At the end of the market, there is one last place you need to visit before leaving, and that is at the Nishiki Tenmangu Shrine. Outside the shrine is the golden Cow Statue. He represents the kami (the spirit) of good fortune and prosperity. Many people pet the cow in the hopes of getting wish. But where you pet the cow is very important. For instance, petting the belly will convey your wish for a safe pregnancy, petting the head will help wish for a cure for headaches and so on. If you notice a foul odour, don't run away. This is coming from the natural spring water that flows up from over 30 meters below. It's safe to drink, and many people think it has special powers and it is pretty common to see people coming with water bottles to bring some home. Towards the back there is a small shrine where you can pray for a safe childbirth. There were three babies coming into my life, so I stopped here, bought three small charms for each child and prayed for them. Months later, they call came into this world safe and sound. I won't say it's due to us but it can't have done any harm. The shrine is especially beautiful in the evening when it is illuminated by the lights of the lanterns which hang outside. If you're into food or even just want to people watch for a little bit, the Nishiki Market in Kyoto is a must see place!